The next annual meeting of the UK Chapter of Computer Applications and Quantitative Methods in Archaeology (CAA-UK) will be held in Bournemouth on the 4th and 5th October 2019 at the Bournemouth International Centre. The conference will be run in conjunction with the BFX Festival which is the UK’s largest visual effects, computer games & animation festival. 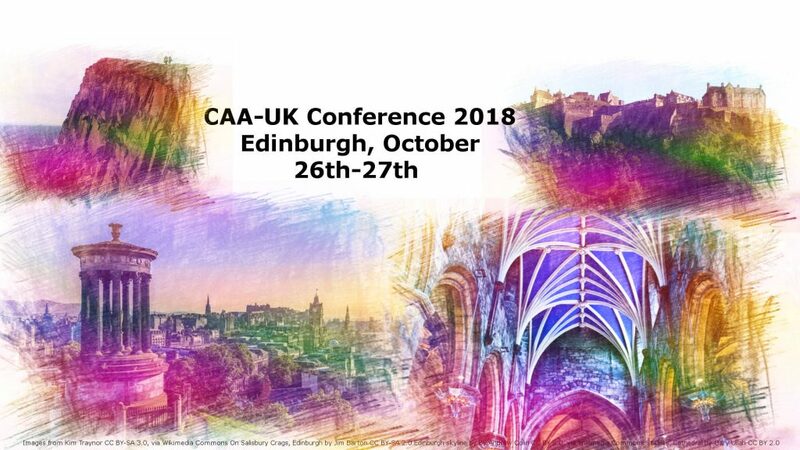 The CAA-UK 2018 AGM will be held on Saturday 27th October 2018, 12:30-13:00. The preliminary schedule for CAAUK is up and registration is open (see both below). We have full tickets and concession tickets for those that can not afford to pay the full price. There is no criteria for concession tickets except for need. If you can not afford the full price then purchase a concession ticket. Ticket sales will end when we have reached our fire capacity limit for the building (160) or October 19th, whichever comes first. Because of catering we can not accept purchases of tickets at the conference as we need to book food a week in advance. We are looking to support the travel of groups – University society, companies, just a bunch of friends interested in great archaeology and computing, etc. If you could get in touch with us right away if there will be several of you traveling and we can see if we can support you. Individuals will be considered too but preference will be given to groups. This is the preliminary schedule for the conference so it is subject to change. Details of the conference can be found on our website shortly and we will be be updating this with new information over the next couple of months. The CAA-UK 2017 AGM will be held on Sunday 5th March 2017, 16:00-17:00. For those who still want to come – please register here. There has been a room change – We are no longer meeting in the Ashburton Hall and will instead meet in the Mitchell Room. The presenter of “The contribution of the 3D modelling in the ethno-archaeological studies. The case-study of the village of Qdeir in Syria” is now unable to attend. The positions of Secretary and Treasurer on the CAA-UK committee will be up for election at the AGM on Sunday 5th March 2017. Anyone who is interested in standing for these post should email the Secretary of CAA-UK by 14:00 on Sunday, 5th March 2017. For more information about these roles please look at our Constitution or email the Secretary for more information. Registration for the CAA-UK conference in Winchester on the 4th and 5th March 2017 is open! Registration will include lunches on both days. In order to provide for various dietary requirements, we ask that attendees register as soon as possible. Registration with lunches included will close on the 22nd February. Any person registering after the 22nd February will not be guaranteed a lunch as our catering team require advanced numbers. CAA-UK 2017: Registration is Open! We are pleased to announce that registration for the CAA-UK conference in Winchester on the 4th and 5th March 2017 is now open!